For every 1% increase in inbreeding, a dog lives on average 20.6 days less. Leroy G & X Rognon 2013 Breeding practices according to breeds, time and place, and consequences. 6th Tuft's Canine & Feline Breeding and Genetics Conference, Sept 27-29, 2013, Boston. Wildt DE, EJ Baas, PK Chakraborty, TL Wolfle & AP Stewart. 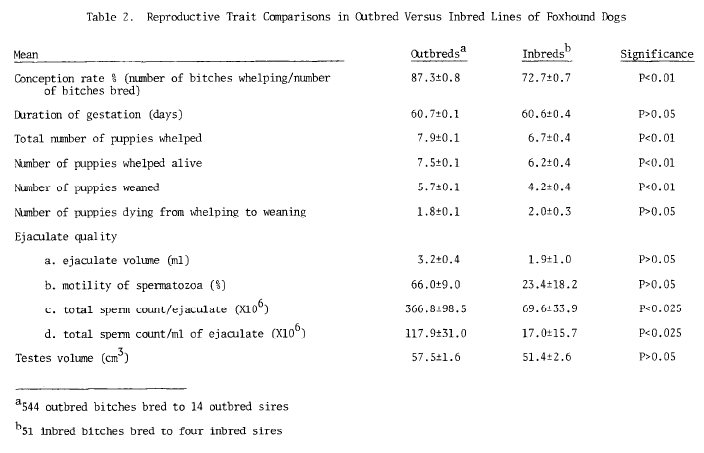 1982 Influence of inbreeding on reproductive performance, ejaculate quality and testicular volume in the dog. Theriogenology 17: 445-452.